John Phelan, national director, HBAN speaking at the Halo Business Angel Network All-Island Conference 2018, sponsored by Elkstone and Flynn O’Driscoll. A record-breaking almost 300 current and prospective business angels attended the event. HBAN (Halo Business Angel Network), the all-island organisation responsible for the promotion of business angel investment, and joint initiative of Enterprise Ireland and InterTradeIreland, saw a record-breaking almost 300 current and prospective business angels attend its All-Island Conference 2018, sponsored by Elkstone and Flynn O’Driscoll, making it the largest gathering of business angels ever in Ireland. 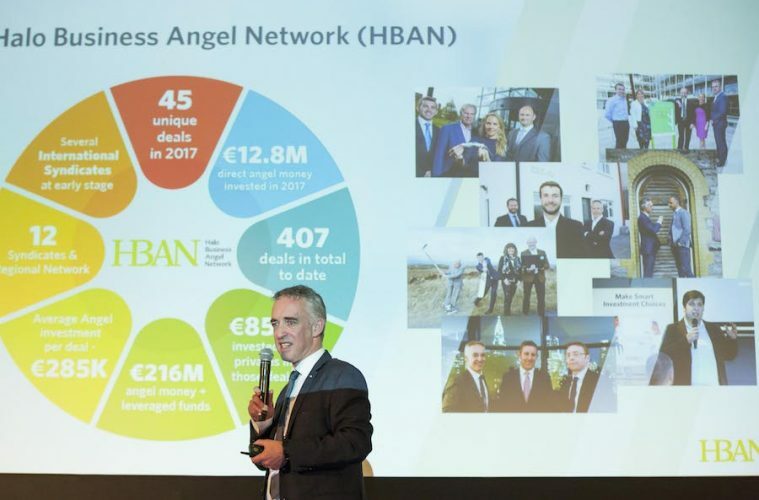 HBAN aimed to sign up 35 new business angels at the conference and have already signed up 21 new investors in advance of the conference, indicating the strong interest in angel investing. There were representatives from nine syndicates in attendance. Seven Irish-based including the MedTech Syndicate, Irrus Investments, Food Syndicate, Bloom Equity, Boole Investments, WxNW Syndicate (West by North West) and SEBAN (South East Business Angel Network). There were also representatives from several overseas syndicates including the New York syndicate HBAN has partnered with. The event drew current and prospective business angel investors from all over the country to the Royal Hospital Kilmainham, where they had the chance to meet and network with members of Ireland’s business angel community and learn about the opportunities for angel investing in Ireland. Key speakers included super angel Christopher Mirabile, who outlined his advice for angel investors based on his experience of more than 60 investments, focusing on the importance of syndicated investing. Serial tech entrepreneur Peter Cowley spoke about what to look for in an investee company, key metrics for evaluating companies, the importance of investing as part of a syndicate and some of the pitfalls in angel investing. Feargall Kenny summarised what Irish start-ups need to do to break into the US market, giving a list of 10 things not to do. John Phelan, national director, HBAN said, “The number of people here today and the 21 new angels we’ve signed up before the conference is indicative of the interest in angel investment and a testament to the vibrant Irish start-up scene, as well as the number of high potential companies there are. Two of the breakout sessions proved very popular with attendees – term sheets and due diligence and tax efficient angel investments. Alan O’Driscoll, Partner, Flynn O’Driscoll talked about the importance of putting in place a legally binding agreement between the investor and investee, also known as a term sheet, this document outlines what investors and entrepreneurs agree to, what the agreement should contain and how to put it together. Laura Lynch, Laura Lynch & Associates spoke about the tax implication for angel investing including how to sell a business tax efficiently and tax incentives for both entrepreneurs and investors. HBAN host events specifically for business angels all year round and across the island. Planning is underway for a business angels masterclass and members webinars on a range of topics later in the year. For more information on events visit www.hban.org.